Mechanical layout of the spectrometer includes two pressure chambers, filter and camera lens housings above a stable frame. 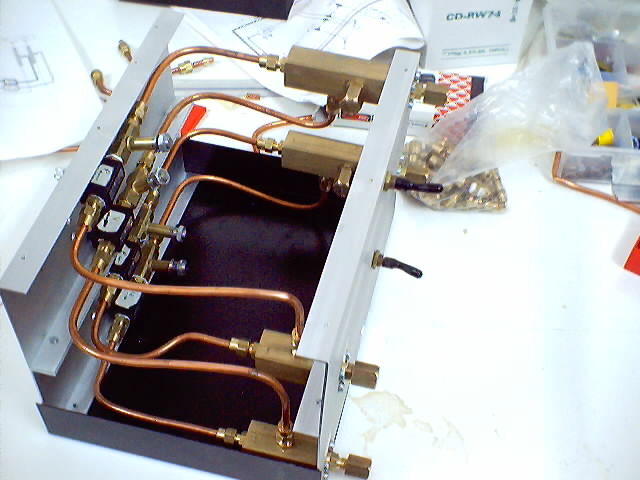 CCD camera dewar goes under the chambers. There are vacuum and pressure tight windows between the sides of the chambers on the optical path. Absolute pressure in each of the chamber are measured by sensors, sampled by an A/D converter and the valves are controlled by a data aquisition system. A mechanical vacuum pump and N2 gas controls the pressure between 0.02 and 2.00 bars. Control Input: Desired chamber pressures and tolerances are suppied through a simple interface. Status Monitor: Chamber status and the ambient temperatures are monitored and logged online.